Summer's finally here. Kind of. Beyond the vitamin D, it also means that more people can hit the town with a camera and notebook without worrying too much about raindrops ruining the lens or blotting out notes beyond recognition. That's right! We've got some news for you below, but we're also looking for more ninjas! Photos, blogs, video, articles, audio... They only take a minute to post! Ok, so photos and video might take a little longer, but it's still pretty quick. To post your news, blog, photos, etc, you just need to sign up for an account if you don't have one set up already. And yes, to sign up for a free account you will need to scroll down past the options to become a sustainer, donate and subscribe, because the Media Co-op network also needs sustainers to keep delivering quality independent news to your computer screen, inbox, mailbox, and/or hands. But if you want help setting up an account, a quick overview of how to post, or if you just want to check out what's going on in the VMC, come to our next meeting! You can find us this coming Wednesday, July 25, at 6:30pm, at Spartacus Books (684 East Hastings, between Heatley and Princess). Not in town? Busy? Hate meetings? No problem. 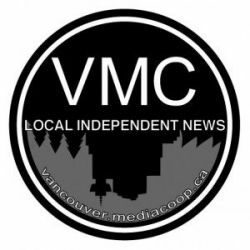 Drop us a line at vmc (at) mediacoop.ca if you'd like to get involved or have a story idea. There's also a post for reader-generated story ideas at the national level, but feel free to post local story ideas there too. We'll find them. We're sneaky like that. Speaking of local stories, the Downtown Eastside Not for Developers Coalition was back at the Pantages rubble site last Monday, giving the City of Vancouver one week to take action before the community does. Peter Haywood posted an account of the police violence at the June 27 Casseroles protest and the arrests, including his own. There's another great article by Kerry Coast, this time looking at the results and background of the July 10 Sliammon treaty re-vote. Check out the VMC site for more! On the national foreign policy front, The Dominion just published an article yesterday about the appointment of ex-cop Julian Fantino to Canada's international development portfolio. There's an audio interview up on the Media Co-op about the resistance to a Vancouver-based company's mining project and its impending nationalization in Bolivia. And the Constitutional Court is going to hear an Indigenous challenge to the mining law in Guatemala, where Vancouver-based companies Goldcorp and Radius Gold operate. And coming up in our next newsletter is [This Could Be Your Headline]!